Clear braces in Rancho Cucamonga are a popular choice for teens and adults who want to make a less-noticeable statement with their commitment to a healthier smile. You’ll be struck by the natural look of these smooth, sculpted, and completely clear ceramic braces, which will not stain or discolor and which can be blended in with your unique tooth shade. Ceramic braces from American Orthodontics offer our patients the look they want, with all of the functionality of traditional metal braces. Their comfortable, sculptured design and attractive translucent appearance help provide the self-confidence that comes from wearing braces that look as good as they perform. We believe every individual has the right to live their life with a smile they truly love! 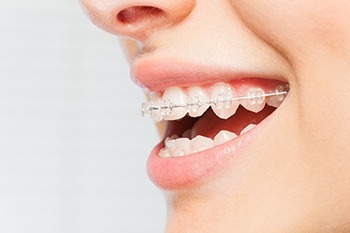 Learn More About Clear Braces in Rancho Cucamonga Today! If you believe you or your teen could benefit from clear braces, then please contact us to schedule a free, no-obligation Orthodontics Consultation. Call 909.945.0024 or click here to secure your appointment, which includes a complete exam, x-rays, and a comprehensive treatment consultation with our orthodontist. As a bonus, you will also receive a gift bag, $1,000 off treatment, and 1/2 off in-office teeth whitening upon completion of treatment! Come experience 5-star-rated treatment at California Dental Care & Orthodontics – we can’t wait to help you achieve your happiest, healthiest smile!